Home › Home and Kitchen › Homeway Essentials Silicone Suction Lids - 5 Pack Food Cover Microwave Cover ..
Homeway Essentials Silicone Suction Lids - 5 Pack Food Cover Microwave Cover ..
5 COLORFUL SILICONE LIDS & 1 oz. Mini Bowl. Bring your kitchen to life with these fun silicone food covers! Use the large silicone lids for pots and pans. Use the medium lid as bowl cover or microwave cover to prevent splatter. The smaller lid is perfect to cover cans, cups, mugs and jars. Use Mini bowl as a pinch bowl for spices & herbs, for dips or sauces. This product is only sold by American Homeway. VARIETY OF USES These Silicone Lids will fit any smooth surface including ceramic, glass, porcelain, stainless steel and more! Microwave safe and Oven Safe. Lids Sizes: 12 in., 10 in., 8 in., 6 in., 4.75 in. Mini bowl size (1 oz): 2.30 in. x 1.10 in. CREATE AN AIRTIGHT SEAL by placing the Flat Silicone Lids on bowls, pots and pans. Press down gently in the center of Lid to form an airtight seal. Replace missing or broken lids with these Reusable Lids. These Food Covers keep dust and insects away for picnics, barbecues or parties. Use the Silicone Lids to cover left overs in the fridge and to keep your salads and fruits fresh! 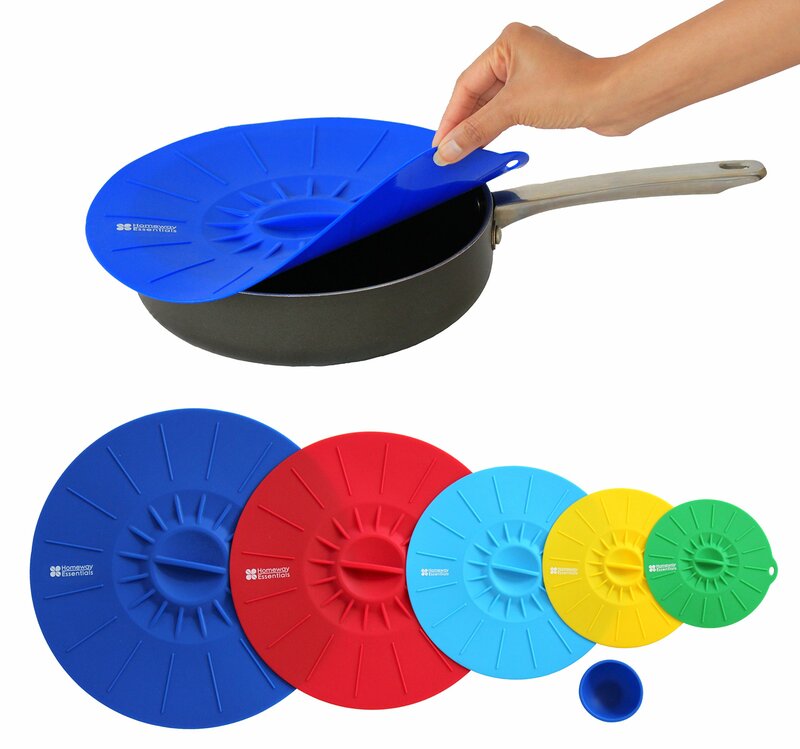 HIGH QUALITY Homeway Essentials Silicone Suction Lids are made of Food Safe Silicone. Don't be fooled by cheap imitations! These Silicone Food Covers are flexible and long lasting! We are so sure you will love your Silicone Lids Set that we offer a 100% money back guarantee. FUN AND COLORFUL SILICONE LIDS: Bring your kitchen to life with this PremiumQuality Silicone Lids Set. FDA Approved. BPA Free. These Silicone Food Coversare safe, stylish and made of High Quality Silicone. Don't be fooled by cheapimitations, choose the Homeway Essentials brand for your family. AIR-TIGHTSEAL:These Silicone Suction Lids have amazing suction power that create anairtight seal around your containers to keep food fresh. To create the suctionand form a seal press down gently in the center of the lid. Try these as bowlcovers and microwave covers. EASY TO CLEAN AND SAVE MONEY: These Silicone FoodCovers are easy to clean and also Top-Rack Dishwasher safe. SAVE your money -No more plastic wrap or aluminum foil! Use the Lids instead to cover yourbowls, pots and pans! MULTIPLE USES:Use Silicone Lids as Instant Pot Lids orpans lids or bowl covers. Safe to use as a microwave splatter cover to preventthat mess! Use as food covers in the fridge for leftovers to keep food fresh.Great for outdoors during picnics, parties and barbecues - keep the dust,dirt, sand and insects away. VARIETY OF SIZES:Silicone lids set includes 5Lids: 12 in., 10 in., 8 in., 6 in., 4.75 in. Mini bowl (1 oz): 2.30 in. x 1.10in. - Use as a pinch bowl for spices and herbs, for dipping ketchup or BBQsauce or to store jewelry while washing dishes! SAFETY INFORMATION:The Mini-Bowl is NOT a toy - keep away from small children. Oven safe up to 440 degreesF. Do not use directly on oven surfaces. Do not expose lids to direct flame.Do not carry by the lid handle. ORDER NOW: Makes a great GIFT! AmericanHomeway is the ONLY Authorized distributor of the Homeway Essentials Brand.Buy now from American Homeway. 100% Money-back guarantee.